Terminal Poker has closed its doors and is no longer in operation. You can find a full list of active mobile poker rooms here. We recommend BetOnline Poker as their iOS and Android poker apps supports cash games, fast fold poker and both Sit N Go and Multi-Table poker tournaments. They also accept U.S. poker players. Play Texas Hold'em or Omaha. iPhone, iPad, Android (Samsung, HTC, LG, Google etc.) or Windows Phone. Compete in Sit & Go and MTT Scheduled Tournaments from your phone. Play instantly from the browser of any internet-enabled phone or tablet. Terminal Poker is the poker room owned by the Maltese company Elec Games Limited. 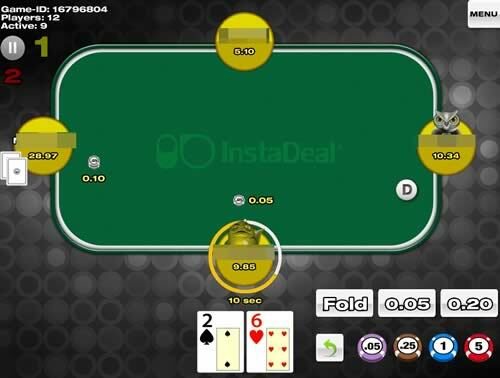 They also run a casino and sport-betting site, and three separate poker rooms – 'Instadeal' for simple ring games, 'The Hive' for more serious players including decent-sized tournament prizes, and 'League' for the keenly competitive poker fiend. In 2011 Terminal Poker released a mobile app for iOS and Android poker site that immediately impressed everyone with its range of features and game options. Terminal Poker have made several amendments to their mobile app since its release to make it better than ever. You can read here about all you need to do get this app onto your mobile device. You will need to register a new player account with Terminal Poker before you can use the Terminal Poker Mobile App. If you visit the Terminal Poker website Terminal Poker you will see a blue button in the top right hand corner of the screen saying 'Register' – click here to be taken through to the registration process, where you will need to fill in your personal details, your email address, username and password. Once you've done all that hit the large “Register” button at the bottom of the screen and you should be all set. iOS Devices: The app for Terminal Poker on iOS Devices runs as a browser-based program. To access the app on your phone or tablet, visit the sites from your device and press “Add to Home Screen”. If you are okay with the default settings assigned to the shortcut, select “Add” in the top right hand corner of the screen. A 'Terminal Poker' icon will now appear on your home screen. Whenever you want a little bit of mobile action, simply select the icon and the Terminal Poker Mobile App will be launched in full screen mode. Android Devices: If you do not have Google Chrome installed and set as the default browser on your device, then it is recommended that you do so in order for the best performance of the app. Once you've downloaded and installed Chrome, visit the site from your tablet or phone and select “Add to the home screen”. If you're satisfied with the shortcut name, select “Add”. An icon for 'Terminal Poker' will now appear on your mobile device's home screen. To commence play using the Terminal Poker Mobile App simply select the icon. Windows Phone Devices: Terminal Poker supports real money poker on Windows Phone Microsoft Lumia. Users of Windows Phone Lumia devices from Nokia or Microsoft should also have no problem playing poker from the browser of their phone or tablet. The Terminal Poker Mobile App allows you to access all the options available at the site – poker, sports and casino. You can also effortlessly make deposits and withdrawals, and check your transaction history. 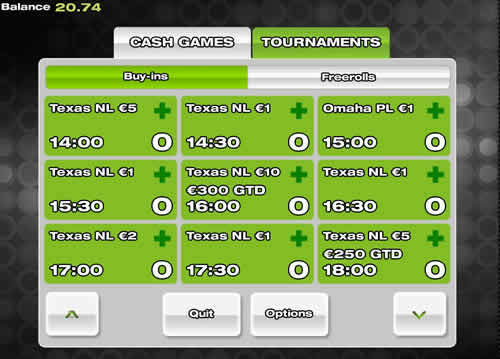 If you head to the poker lobby within the app you can choose between cash games and tournaments. 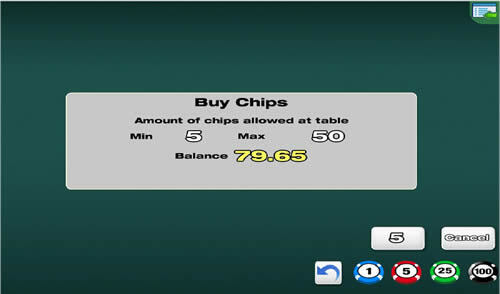 The cash games screen will show the range of games available (the app supports Texas Hold'em and Omaha), the average pot sizes and the number of empty seats available. The tournaments screen includes both scheduled tournaments (single tables and MTTs) and Sit & Go's. You can easily see the game and type (no limit or pot limit), the style (regular, turbo and superturbo), the buy-in, the scheduled start time and the number of players registered. The table display itself is a little basic, but it gets the job done perfectly adequately. There are no unnecessary avatars to clutter up the screen, and you can easily throw in just as many chips as you want whenever it's your turn. The screen is responsive and the action is always at a nice pace. The players that you are likely to encounter at Terminal Poker seem to be more on the loose side than tight. If you know what you're doing when it comes to flops, pot odds and equity, then you'll probably be someone who's likely to be bolstering their bankroll. Bonuses and Promotions When you sign up for Terminal Poker you can take advantage of two welcome bonuses – a deposit bonus worth up to €400, or a 'quick' deposit bonus of €20. The bonus is a 200 percent matched bonus, so if you deposit €200 into your account, you will receive the full €400. The deposit bonus is obtained by using the bonus code TP400, and you can use your bonus with any one of Terminal Poker's products: Poker, Casino and Sportsbook. Casino – one user point per €5 wagered in blackjack, €1 in roulette and table games, and $0.50 in slots, video poker and other games. To obtain the €20 bonus you can use the deposit code TER20. Deposit €20 and you'll receive the free €20 after you have earned just one single user point! It really is as simple as that! You can use Visa, MasterCard, Skrill or Neteller to fund your account, or transfer funds directly from your bank. Withdrawal is achieved by the same methods, although in some countries you will not be able to withdraw to a MasterCard account. The Terminal Poker Mobile App is definitely an app that gets most things right. In fact it's difficult to find anything that the app gets wrong. 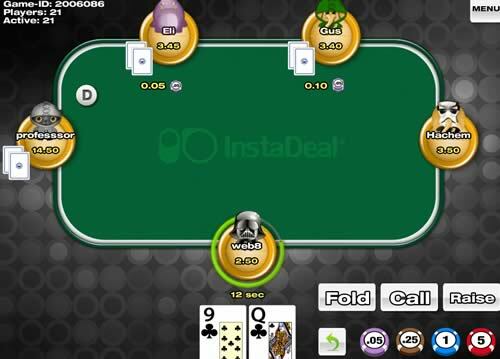 True, the appearance of the app is a little basic, but that doesn't deter you away from the game-play at all, and it's a plus point that so many different varieties of poker are available via the app. The more casual poker player will no doubt appreciate the inclusion of sports betting and casino facilities. We suggest you sign up ASAP and get the Terminal Poker Mobile App on your chosen mobile device. Don't forgot to choose which of the welcome bonuses is right for you.